Being a businessman, I have to travel a lot and it gets difficult for me to carry my laptop wherever I go, which is why I needed mobile friendly software to take care of my network marketing campaigns. And I got a very easy solution for my problem in WTK Network Software. Now, I can work with my distributors even on the go. The software came as a huge relief to me. Now I’m not confined to any geographical or travelling barriers as I can always connect to distributors and monitor the sales even through my phone. I tried the Demo of the software first and needless to say, I was truly impressed with the advanced inbuilt features. I ordered for WTK Software 3 domains license, as I wanted this for some of my friends business website too. The reason I opted for this is that it’s quite easy to configure and monitor all the features of digital media business. I don’t want to worry about tracking or monitoring the activities offline, as everything is done online instantly. I was looking for good software to downline tracking & commission payouts and someone recommended WTK Network Software to me. And since then, the tracking has gotten so easy and I am very thankful to WTK Network Software for helping me achieve great results. I can assure that this is the perfect solution for all network marketing projects. The satisfaction I received through this software has urged me to recommend it to everyone else looking for an easy fix for their network marketing troubles. I am so impressed with the way WTK Software works, commissions are credited to upline distributors immediately after a sale. It supports Gmail, Yahoo, and Facebook inviting & posting, that makes promoting job easy for distributors. Since I’ve setup PayPal payment procedure, activation of my distributors is done automatically and instantly. This software helps me to provide downloadable digital-supported products online. Moreover, it is customizable, where I can have my own web content, color, and banners. This is one of the best network marketing software that i have tried. WTK Network software is both admin friendly and user friendly. Simple and clear admin backend makes it easy for me to manage the business without spending much time. Recently, it was getting very difficult for me to manage my network marketing business as it started seeing a steady growth. When researching for better ways to do the management part, I came across WTK software and decided to try it. I should say the results were awesome as most of the tasks were automated without the need for my intervention or any kind of offline tracking. This helped me to concentrate on other work and my workload decreased greatly. The shopping cart, payment gateway, and literally everything about WTK is amazing. It’s a strong recommendation I would make to anyone looking for network marketing/MLM business script. Our business has just expanded into the international market and we needed a strong platform to launch it. WTK Network software did just that for us. The business analysis team did a great job with comprehending our business and worked in perfect synchrony with our market research team. They came up with an effective software model and gave us a detailed demo. The application was launched just last week and has already picked up pace with the international market. The application is available in languages like German and Hindi, which is a huge advantage as India and Germany feature as our key target market. I highly recommend to businesses if you are venturing into the international market for the first time. I got to purchase WTK Network Software after I heard positive feedbacks for the product from few of my acquaintances who had used it. I was a bit skeptical when I placed my order, but then my views were totally changed once I started using it and today I’ve started vouching for it to the others looking for a network software app. I gained so confidence about the tool that I’ve already ordered for a single domain license for lifetime. The multiple languages and different currencies that it supports is surely an add-on feature that’s also its USP, which in turn has helped my business that has an international reach! 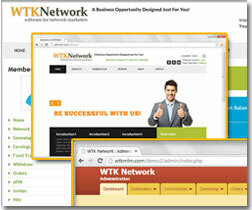 WTK Network Software is undoubtedly a comprehensive solution for managing network marketing business of any kind. I purchased this recently and installed it for managing my business. I’ve seen amazing results within a few days of use, making my work easier. It’s absolutely simple to use even for beginners with its user-friendly features. I’m looking forward to see more advanced versions of the tool that can simplify tasks even greater! I thank the WTK team for developing such an all-inclusive solution for network marketing management! A boon for businessmen like me!